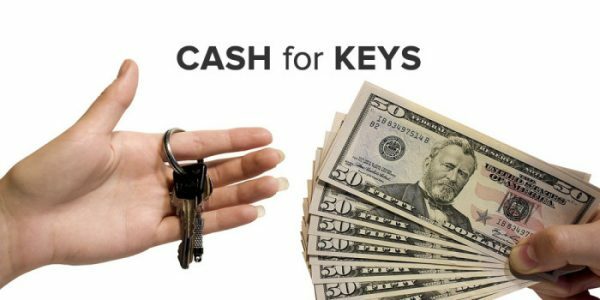 The City of West Hollywood is looking to put some controls on “keys for cash,” an increasingly popular way for landlords to entice tenants to leave their rent-stabilized apartments so they bump the rent to market rates. A proposal to regulate the practice of paying tenants to move out will go before the West Hollywood City Council at its meeting Monday night. That false information includes telling a tenant that the landlord will pursue an eviction at some point in the future, so it would be wise to take the cash offer now. Some landlords have said they will start construction on the apartment building, which is likely to be disruptive to the tenants who live in it. Under existing law, if a tenant moves out a landlord then can raise rent on a rent-stabilized apartment to the market rate, which has reached levels that many rent-stabilized tenants could not afford. That ability has led to allegations by some tenants that their landlords harass them to get them to leave. Otherwise, the landlord may increase rent only by an amount set each year by the city’s Rent Stabilization Commission. That increase is tied to the annual increase in the cost of living index and most recently was 3%. The only other option is for the landlord to evict all tenants under the Ellis Act, but the landlord can only do that if he or she plans to leave the apartment rental business. And then landlord has to pay a fee to the tenants, which can range from $7,121 for a studio apartment to $23,738 for a three-bedroom apartment occupied by a tenant with an income no higher than $54,250. 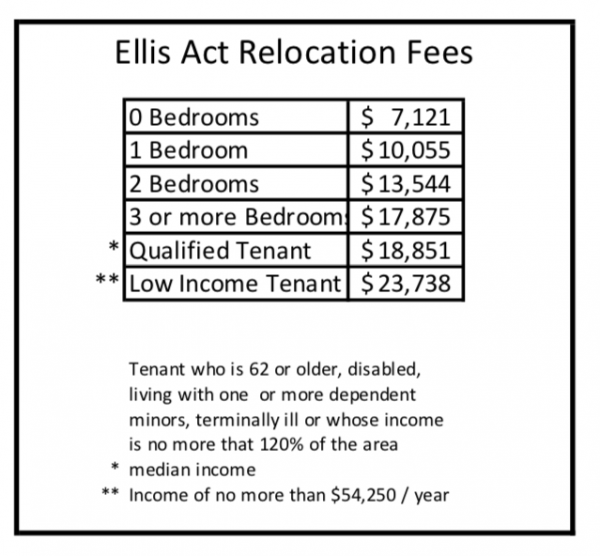 Relocation fees that landlords currently must pay tenants forced to move out under the Ellis Act. — Requiring written disclosure before a buyout offer is made that a tenant is not obligated to enter into either buyout negotiations or a buyout agreement. –Requiring that all buyout agreements be in writing and disclose the 30 day right to rescind. –Allowing a 30 day window for a tenant to rescind a properly executed buyout agreement. –Requiring that the tenant be informed in writing that he or she may consult a lawyer or seek additional information regarding buyout agreements from the city’s Rent Stabilization and Housing Division. –Providing a right to tenants to rescind a buyout agreement at any time if the required written disclosures are not made. — Requiring that all executed buyout agreements, along with written proof of service of the agreement at least ten days prior to execution of the agreement, be filed with the Rent Stabilization and Housing Division. The ordinance’s reporting requirement would allow the city to collect data on buyout agreement trends. The City Council will meet at 6:30 p.m. on Monday at the City Council Chambers, 625 N. San Vicente Blvd. south of Santa Monica. Parking is free in the five-story structure behind the chambers with a ticket validated in the lobby.